LAKELAND, Fla. – Florida Polytechnic University’s iconic Innovation, Science and Technology (IST) Building in Lakeland now ranks as one of the 16 “most breathtaking” buildings in the world, according to a survey of architects, placing it alongside iconic structures such as the Parthenon in Greece, the Empire State Building and Frank Lloyd Wright’s “Fallingwater” residence. 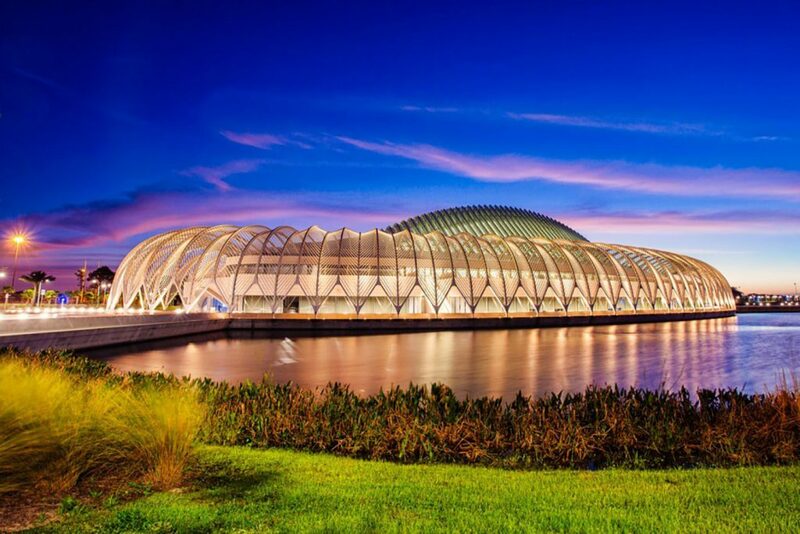 Designed by internationally-renowned architect Dr. Santiago Calatrava, the IST Building is the cornerstone of Florida Poly’s campus and the University’s main classroom and laboratory building. The 162,000-square-foot, white-domed building is a moveable and functional work of art, with a louvered roof system that adjusts with the sun’s angle, surrounded by a ring of curved metal pergolas that shade its outer terrace and walkways. Calatrava repeatedly breaks new ground in architecture, with soaring designs for a new transit station at the rebuilt World Trade Center, a spiraling “Turning Torso” skyscraper in Sweden and the Peace Bridge in Calgary. Among the numerous awards associated with the IST Building is the distinguished Engineering News Record’s (ENR) Global Project of the Year award. 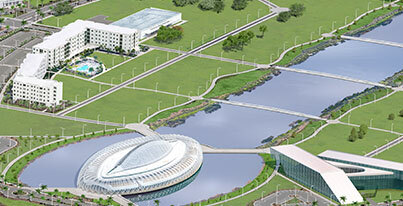 The IST Building houses 26 classrooms, the Aula Magna auditorium, faculty and administrative offices, an 11,000-square-foot Commons area and 11 innovation labs – including a 3D printing lab, cyber security lab and heath informatics lab – where students are able to get hands-on experience with the latest technology. Skanska USA was the lead contractor.